He is too full of his own self-importance to have realized, well beforehand, the woeful inadvisability of the former President of the Democratic Republic of Ghana to have convened a plenary conference with the locally resident members of the diplomatic corps to vacuously complain about the nonexistent violence that supposedly marred the Ayawaso-West Wuogon byelection, whose only one occurrence of violence was, predictably, fomented by some key National Democratic Congress’ operatives; and, of course, diehard Mahama shills like Mr. Samuel George Nartey, the NDC’s Member of Parliament for the Ningo-Prampram Constituency, in the Greater-Accra Region, who, according to reliable news reports, rode ahead of a convoy of some 15 or 20 motorbikes – depending on which news source one reads, views or listens to – into the Ayawaso-West Wuogon Constituency on the day of the byelection, occasioned by the passing of the New Patriotic Party’s Parliamentary Representative for the aforesaid constituency, Mr. Emmanuel Kyeremateng Agyarko, the man whose widow, Mrs. Lydia Sayram Agarko, expectedly, emerged as the convincing winner of the byelection. The NDC’s operatives had, apparently, hoped to use Mrs. Agyarko’s stereotypical femininity, at least in the blighted and jaundiced imagination of these seasoned political scam-artists, and her vulnerability as a widow mourning the recent death of her husband, to cynically and callously, and opportunistically, wrest the Ayawaso-West Wuogon Constituency Seat from the ruling New Patriotic Party (NPP). Fat chance! I say. So, the first issue that the former President ought to have addressed or tackled, if he were, indeed, the politician of great integrity that he claims to be, ought to have been a comprehensive explanation for precisely why Mr. Nartey – aka Sam George, his former Presidential Staffer – had a gang of National Democratic Congress-sponsored thugs dressed in the same colors of uniforms as operatives of our National Security Agency (NSA) invade the Ayawaso-West Wuogon Constituency. Indeed, we even have on record that Dr. Alfred Oko Vanderpuye, the former Chief Executive Officer of the Accra Metropolitan Assembly (AMA), or former Mayor of Accra, had sternly warned the Ningo-Prampram NDC’s MP that the latter was in flagrant breach of the country’s election laws but to absolutely no avail. 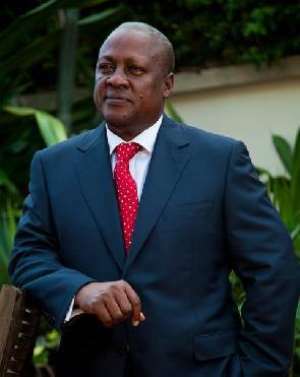 Even more significant, a clinically mendacious former President John Dramani Mahama ought to have explained to the members of the diplomatic corps, why the former Atta-Mills’ arch-lieutenant felt that the wanton acts of mayhem that allegedly characterized the various previous byelections that occurred under his watch, including Talensi and Chereponi, in the northern-half of the country, and the at once inexcusably primitive and scandalous reprise of the same that occurred in the Atiwa Constituency, in the Eastern Region, the home-turf of the now-President Addo Dankwa Akufo-Addo, were veritably symbolic or striking examples of Ghanaian democracy at its maximum best but, somehow, the purported incidence of violence that rocked the Ayawaso-West Wuogon byelection, somehow, came out of a political playbook that had been authored and published in the 16 century, in the words of the former President. Then, of course, there was also the Sefwi/Sehwi-Amenfi byelection apocalypse, also fully supervised by then-President Mahama, in full regalia, that occurred in Western Ghana. Then also, Mr. Mahama ought to have reminded the locally resident members of the diplomatic corps about the reckless justification provided by his own Interior Minister, perhaps directly coached by the former Commander-in-Chief of the Ghana Armed Forces, to wit, Mr. Mark Woyongo, for the infamous and injurious hostilities that occurred at Talensi. I think Mr. Woyongo’s rather unconscionably cavalier response went something like the following: “Of course, violence begets violence. This most sound logic has been the rule and the norm since Adam and Eve.” Even more significant to highlight was the fact that the two videoclips reportedly screened to the diplomats by Mr. Mahama turned out not to have been shot in the Ayawaso-West Wuogon Constituency at all, but rather at the funerals of some police officers who lost their lives in the proverbial line of duty. What the foregoing inescapably means is that the former President called the members of the diplomatic corps in order to wickedly fool them with the criminal peddling of patent falsehood. I am also sorry to say that Mr. Agyenim-Boateng, the career Deputy Minister and presently a Spokesman for the 2020 Mahama Presidential Campaign, I suppose, who wrote and published the patent pabulum shamelessly passed off as a sound defense of Mr. Mahama’s whole-cloth of mendacity, does not speak or any remarkably appreciate the Akan language with both a native speaker’s understanding and appreciation for the same; else, I would have given him some real culturally brewed words of wisdom. I also don’t suppose for a split-second that any fairly well-educated native Gonja speaker, such as Mr. Mahama, even half-agrees with the former President that what he did, by parading himself stark naked before the members of the diplomatic corps and, by logical extension, the international community, was befitting of a former President of the august Democratic Republic of Ghana and the former Commander-in-Chief of the Ghana Armed Forces. Tofiakwa!